Did these little dudes come straight out of a Pac-Man game? These octopi squirt soap instead of ink -- which is cool 'cause ink definitely won't clean the dishes. These little guys look like they're straight out of a Pac-Man Game. OK, we know those were ghosts, but still! 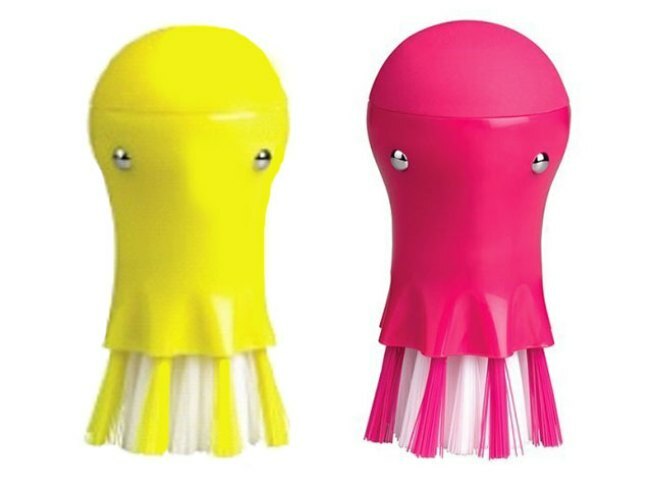 Available in hot pink or yellow, your new scrubby buddy has a 2.1-ounce soap reservoir and a soap-release button. And at $6.99, it's only a couple bucks more than an ordinary boring sponge. (Which is, if you think about it, also come from the sea. Weeeeird.) Available at Home Rule (1807 14th St. N.W.). Vintage-style swimsuits continue to be all the rage right now, and they're awfully forgiving of too many late nights at Ben's Chili Bowl. The end of the summer means you can score big savings on suits -- with enough time left over to debut it at the beach well before Labor Day. J. Crew's solid ruched-V bandeau tank is marked down from $78 to $49.99-$59.99, depending on your color choice. There's a removable halter strap depending on whether you plan to fight with the waves or tan on your towel. The blend of nylon and Lycra promises to be quick-drying and fade resistant. The shelf bra keeps everything where it's supposed to be (we hope). Available from the catalog or online only. Guys' skin gets scaly in the summer, too, but the thing is, guys usually don't bother to do anything about it. For shame, dudes, for shame. That's where the "Ultimate Man" Body Scrub Soap ($12.50) comes in. The soap's made with bran and oatmeal and gritty little bits of, well, something, to scrape off your coarse exterior simply while showering. We promise it won't make you cry while watching your soaps. From Kiehl's (3110 M St. N.W. ).